Sometimes when members have arrived to take photos for a family, foot and hand prints have been taken of the baby. If the skin is especially fragile, sometimes the ink is left on the baby's feet and hands. We understand that foot and hand prints also provide precious memories, but unfortunately, ink can make it difficult to capture beautiful photos. black all over his feet and I never go the chance to see them or get photos of them without it. His skin was too delicate to even attempt to wipe off." his beautiful body and then I just wanted him clean//.fDF"
Through the generosity of the friends and family of Jackson Reece and Hannah Ivey who participated and supported Paul Ivey and his team in the Blackmores Sydney Marathon in 2013, we have created and made available Heartfelt Inkless Print Kits. 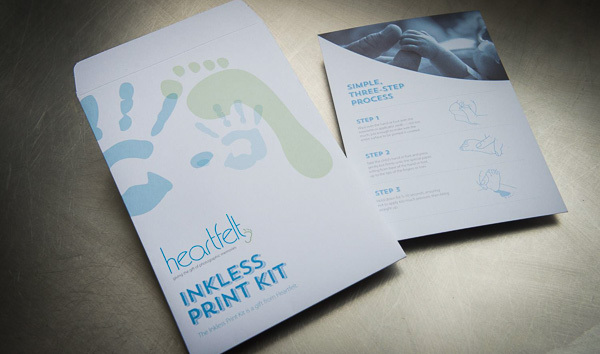 The Heartfelt Inkless Print Kits. can be supplied free of charge for use with families who are eligible for Heartfelt's services. Ink Colours available are Pink, Blue and Grey. If you would like to sponsor some Inkless Print Kits, please go to this page. If you would like to purchase Inkless Kits fro your hospital, please go to this page.